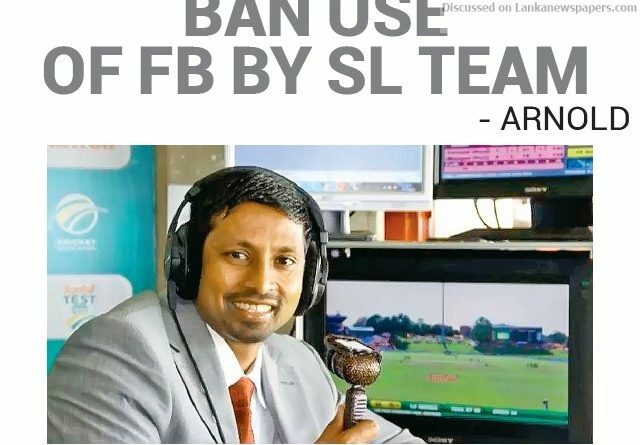 Former Sri Lanka cricketer and cricket commentator Russel Arnold yesterday (30), said that the Sri Lankan national cricket team players should be banned from using social media. Arnold’s remark came following Sri Lankan all-rounder Thisara Perera’s letter to Chief Executive Officer (CEO) of Sri Lanka Cricket Ashley de Silva regarding alleged social media rift between him and Skipper Lasith Malinga’s wife in December 2018. “Sri Lankan players should have been banned from social media long ago!! !” Arnold claimed in his official twitter handle. Perera who was also a Skipper of Sri Lankan national team, alleged in his letter to the SLC CEO that there is no environment of unity in the national cricket team since Lasith Malinga took over the captaincy ahead of the recent New Zealand series. He also called for the captaincy to be changed in order to bring unity and stability back into the team. The unpleasant rift between Perera and Malinga’s wife Tanya Perera erupted on 21 December 2008 when the latter shared a meme on Facebook targeting Perera. The alleged meme claimed that some players who clad in a cheeththaya had gone to newly appointed Sports Minister’s house and asked for a place in the team. In response, Thisara Perera’s wife also launched a scathing attack on Malinga and his wife on Facebook. Later, Thisara Perera too, had written a Facebook post targeting Malinga and his wife. Perera also alleged in his letter that there is a general sense of unease in the team’s dressing room now as two senior players (he and Malinga) are not in good terms. The SLC does not have a social media policy for national team players as of now. Meanwhile, the Sports Minister on yesterday evening met Malinga and Angelo Mathews separately to discuss the current crisis within the cricket team. The minister said that he hopes to meet Thisara Perera once he returns from Bangladesh after 9 February. Perera is currently participating for team Comilla Victorians in Bangladesh Premier League. ← They failed to drive a wedge!